For high mountain thrills perhaps nothing can surpass the magic of heli-skiing. Under a deep blue sky, the skiers are carried by helicopter to a snow-draped peak. And after that there is nothing except steadily distancing whirr of rotor blades, the sky and the snow. 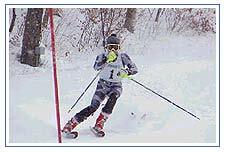 It is a thrilling experience as the skier rapidly zooms down the slopes. Heli-skiing is an expensive sport because participants are taken to high mountain tops or the ridges by the helicopter and dropped there. The skiers than ski down through the unknown route on the slopes. Skiers also choose their own slopes or terrain thus they need not waste time and energy in climbing up the slopes. Himalayas is full of ultimate skiing destinations and if you an extreme sports lover and experienced enough to climb the glacial regions, then take up you heli skiing venture among the Indian Himalayas. Consistent heavy snowfalls and variety of mountain ranges, the Himalayas provide the best attributes for any skier. In addition to the numerous ski resorts throughout the Himalayan region, you can also find the ultimate skiing experiences of heli skiing over here. Getting to the Himalayas is difficult they are far away from most of the people and difficult to get go. A big obstacle is the expense. The actual time spent on the climbing is relatively a small proportion of the total time taken by the mountaineer to get to the mountain. It is an expedition with Sherpas carrying loads of equipment, such as tents, sleeping bags, cooking utensils etc. Of course, costs can be reduced if equipments can be hired and one organises climbs and tours through mountaineering clubs and societies. In Himachal the heli skiing sport is available in the area abound by the Hanuman Tibba, Rohtang Pass, Deo Tibba and Chanderkhani Pass near Manali. A major feature is the compactness of the heli-skiing area. A sortie of ten minutes can carry the skiers to the top of a 14,000-feet high slope. For the first timer heli skiing at the remote locations is always an experience to remember. Remote destination lodge such as the onces located in Manali, provide multiple day packages and are considered to be the best heli skiing regions of the Himalayas. 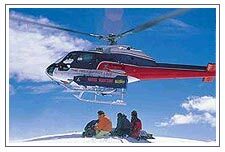 The Manali heli skiing expeditions involve helicopters, which are going to drop keen skiers onto peaks as high as 6,500m. The high peaks reduce the wind speed at lower levels where one skis, resulting in consistent, light and powdery snow. Powder skiing is easier to learn with the new thick kind of skis, especially if you are new to skiing. For interested young and naive skiers, groups of three skiers are made and to keep pace with them there's also a ski guide. The group's size eliminates pressure on less-experienced skiers and allows the experienced ones to ski to their heart's content. Safety is ensured by certified guides, experienced helicopter pilots, easy availability of medical facilities and emergency backup arrangements with the Indian Air Force. 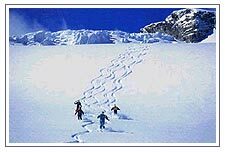 All the heli-skiing packages in Manali include 100,000 ft. of vertical skiing six-day guide service and use of an avalanche transceiver, seven-light lodging in Manali plus all meals, escorted air and ground transfer Delhi-Manali-Delhi, airport transfers and local taxes. South of Kullu, 50-km away in Bhuntar an airport is situated with regular flights to Delhi and Chandigarh. For tourists, taxis are available from Bhuntar to Manali. Heli Skiing is a new sport in Nepalese Himalayas. Being the home of eight of the highest mountains in the world, Nepal brings out the best of skiing and mountaineering expeditions. The Everest region, Annapurna, Dhauligiri, Makalu, Cho Oyu, Kangchenjunga, the Dolpo regions, and more are all ready and waiting for your on-snow signature. It would take a lifetime of skiing each and every area before you skied the same run twice.